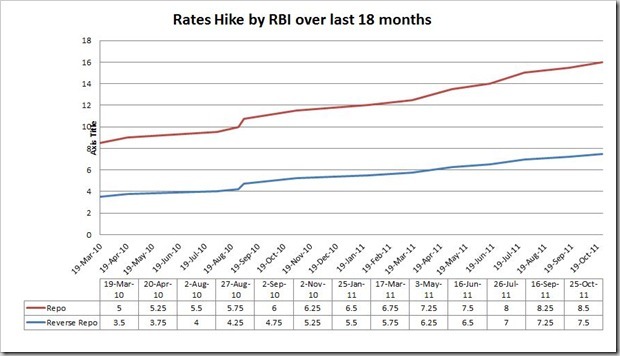 13th interest rate hike in 19 months – How many more? The RBI has pulled the gauntlet with yet another 25 basis points hike in repo and reverse repo rates to 8.5% and 7.5% respectively. As a matter of practice, reverse repo rate is usually determined with a spread of 100 basis points below the policy repo rate. CRR remains unchanged at 6%. If you’re burdened by those monthly EMIs on your expensive home loans, something that should irk you is that the country’s apex banker has raised its benchmark lending rates for 13 times (or 375 bps) since mid March 2010 without much respite to the borrowers. The key repo and reverse repo rates stood at a subdued 5% and 3.5% respectively, until the first half of March 2010. In its latest policy stance, RBI has conceded that even with all the interest rate hikes in last 18 months, inflation has persistently remained stubborn even with visible moderation in growth. In addition, RBI expects inflationary pressures to subside in December and continue on that trajectory into 2012-13, based on normal south-west monsoon and first advance estimates that suggest a record kharif production. Moreover, RBI has downwardly revised GDP growth projections for fiscal 2011-12 to 7.6% on account of slackened investment demand, stalled project execution, downward risks emanating from shaky global economics and concerns about inflation and rising interest rates eating into demand for assets fuelled by borrowed money. Deregulation of Savings Bank Deposit Rates! The RBI has also decided to deregulate Savings Bank Deposit interest rates with immediate effect. Under the new regulation, banks will be set free to determine their savings bank deposit interest rate for deposits of over Rs.1 lakh. Anyways, I hope this interest rate hike is a last one, and hopefully inflation is tamed. Hi, Great articles. Good Job. Now that the interest arte has been de-regulated, I wish all depositors make the right choice and do not get carried away by offers of higher rate on savings accounts. It is always possible to debit some charges/ fees to the depositor’s account and the depositors are helpless. Secondly, we wish all banks, particularly the public sector the banks, are told about solving the so called net work connectivity problems at the earliest. These are the biggest obstacle to improvement in customer service in banks. Yaa looks like we might not see another hike but again Inflation is the major cause of concern. Lets hope for the best as rising price. The last 11 times the Interest rates were hiked, all of them ostensibly to reign in inflation, have failed. Yet, RBI thinks it is the only solution to tackle inflation. So much for these Economists incl MMS and the pseudo one called Montek Singh. Our Economy has been Suffering HUGELY because of Increased Interest Rates Persistently by RBI.RBI should Understand that by Increasing Interest Rates it will Affect Our Overall Growth.Ofcourse Inflation SHALL Be Tamed Today or Tomorrow because the 45 Crores Below Poverty Line Population of Our People is Getting Desperate Day-by-Day because of SUPER-HIGH INFLATION & LOSING CONTROL RAPIDLY.WE ALL KNOW WHAT THAT MEANS.IT IS CLEAR THAT A HUGE PAN-INDIA REVOLUTION IS GOING TO ERUPT ANY TIME SOON IN COMING 2 YEARS.democracy [DEMON-CRAZY] has only Given Poverty & Corruption.WE NEED NATIONALISTIC PRESIDENTIAL RULE THAT WILL TRANSFORM OUR BELOVED MOTHER INDIA INTO SUPERPOWER BOTH ECONOMICALLY & MILITARILY LIKE HOW CHINA ACHIEVED WITH IT’S PRESIDENTIAL RULE!!! INDIA WILL BE MADE A SUPERPOWER BY THE 67% FIERCE YOUNGSTERS IN OUR POPULATION EVENTUALLY!!! We cannot rely completely on central bank to devise the measures in order to combat inflation. Having said that the economy is already battling at many fronts including corruption, weak infrastructure, supply shortage, transport bottlenecks and regulatory issues that hamper free trade, raising interest could possibly have a dampening impact on the economy. Very true. In fact, RBI has been entrusted with the job of dealing with the crisis mainly through its monetary policy measures. For rest of the measures, it has to deal with the issue in association with the government. In my views in order to achieve something concrete on the policy making front both the monetary as well as fiscal policies should work in tandem. Otherwise the growth story of Indian economy will continue to remain entirely different from what is been written on the papers. RBI says that increasing interest rates is neccessary to contain inflation. I dont understand the logic. With interest rate hike, they are increasing the cost of everything under the sun. How they plan to bring down inflation by increasing interest rates? Their concern should be to control money liquidity. They can not achieve that by increasing interest. People who need the capital will borrow irrespective of interst rates. Only those who have the flexibility to borrow or not will benifit. Govt should dismiss this RBI governer and see that he never gets any govt position in his future. Also they should roll back all the hikes in the last 1 year. So the question to ask is when are the next elections coming?? Altaf, we will get new Prime Minister post 2014-elections, unless of course there is no mid-term elections. So, you might have to wait for 3 more years of pain and agony for a new national leader to take over the reigns from the scam-hit UPA government. However, I don’t agree completely with you on roll-back of interest rates imposed over last one year, as that would take us back to almost pre-crisis subsidised interest rate levels. We are certainly not living in 2008-recession era right now to get such monetary policy sops. Yeah, agreed, there is substantial growth slowdown at this juncture. But, a urgent pause in interest rates is the need of the hour; and not more rate hikes from RBI would be desirable from now on. And, yeah, those with borrowed funds will suffer, for sure, in this high interest rate regime.